Dr. Norman B. Ture founded IRET in 1977 and, except for a brief stint as Undersecretary of the Treasury for the Reagan administration in 1981-1982, spent the next twenty years as its President, until his death in August 1997. 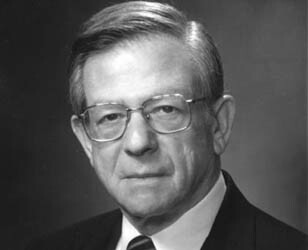 Dr. Ture was a highly respected expert on public tax policy and economics. Under his guidance, IRET became an acknowledged leader in economic research, informing and advising the decisions of public policymakers in Washington and nationwide. Dr. Ture worked tirelessly to help make IRET what it was, right up until his death. In his writings, presentations, and Congressional testimony, as well as in the advice he offered inside and outside of government and to members of both major parties, Norman Ture consistently sought to improve our understanding of how government policies affect the economy. The key point, he explained, is that government actions frequently alter incentives, and people’s responses to changed incentives often have powerful economic effects, for good or ill. A tax that strongly depresses the reward for investment at the margin, for example, is almost certain to inflict damage on individuals throughout the economy in their capacities as workers, business owners, and consumers. In happy contrast, a reform that at the margin lowers the tax system’s bias against saving and investment is likely to bolster work opportunities, output, incomes, and living standards. IRET owed much of its success, and indeed its very existence, to Norman Ture, and we wish to acknowledge here the debt which we owe him, and the sorrow we felt at his passage.